"Spain: Valle De Los Caidos (Valley of the Fallen)" by Chet Smolski, Pedro Muguruza et al. 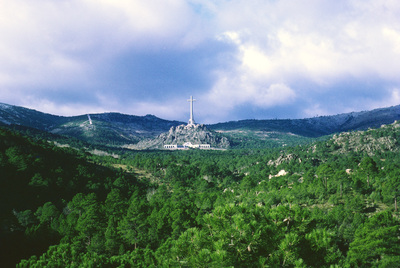 A landmark of of 20th century architecture, the Valley of the Fallen was constructed in memorial to those who fell in the Spainish Civil War. Francisco Franco wanted the monument to be built on a scale like that, “of the monuments of old, which defy time and forgetfulness,” in their grandeur. Work on the monument took 18 years, and was inaugurated in 1958. The monument has been controvertial because a percentage of the construction workforce was made up of convicts, some of which were Popular Front political prisoners. Smolski, Chet; Muguruza, Pedro; and Mendez, Diego, "Spain: Valle De Los Caidos (Valley of the Fallen)" (1969). Smolski Images. 540.